Honors Program Class Travels "From Shiloh to Afghanistan"
An Eastern Kentucky University Honors Program class has spent this semester traveling in space and time – from the American Civil War to the modern-day battlefields of the Middle East. Incorporating creative writing, history and theater arts, the 15 Honors Seminar in the Arts students are writing, directing and performing “From Shiloh to Afghanistan,” a collection of six one-act plays. 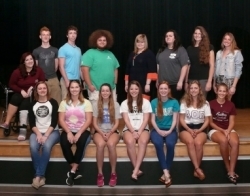 They will present their work on Thursday, May 7, at 8 p.m. in the Black Box Theatre of the EKU Center for the Arts. Admission is free, and tickets may be reserved at ekushiloh@gmail.com or picked up at the door. A shuttle will run between the Daniel Boone Statue in front of the Keen Johnson Building and the Center. For example, one play moves backward from the end to the beginning. In another, a time-traveling student zaps back to the Battle of Shiloh, where he accidentally kills Gen. U.S. Grant, setting off a chain of events that drastically alter the course of history. “An Ignorant Soldier,” in which a student is sent back in time to experience the history he first ignored. “Row Your Boat,” where a strangler and a general are trapped in time and space as one struggles to row toward battle, and the other toward safety. “Shootin’ the Breeze,” a story of four friends relaxing and enjoying the time they have before battle. “Homecoming,” a story that conveys hope and faith to the audience. “The Colonel’s Musket,” which tells of a man who when offered a sum of money for a family heirloom, remembers its true meaning. “Generations,” a story about three generations with different outlooks on the same conflict. In addition, a jug band of musicians from the seminar will perform brief interludes between the acts. The presentation concludes with a poem, “A Veteran’s Litany,” delivered by the cast members. The class is composed of five freshmen, seven sophomores and three juniors. Some of the students are fulfilling a general education requirement in the arts, others a general requirement in the humanities.